Today's the day. 'Reboot Your Health: Simple DIY Tests and Solutions to Assess and Improve Your Health’ is published by Hay House! The first few days of a books life are crucial to its long term success, depending on all sorts of Google and Amazon algorithms. The more people seem interested at the beginning, the more the bookshops will stock and promote it. 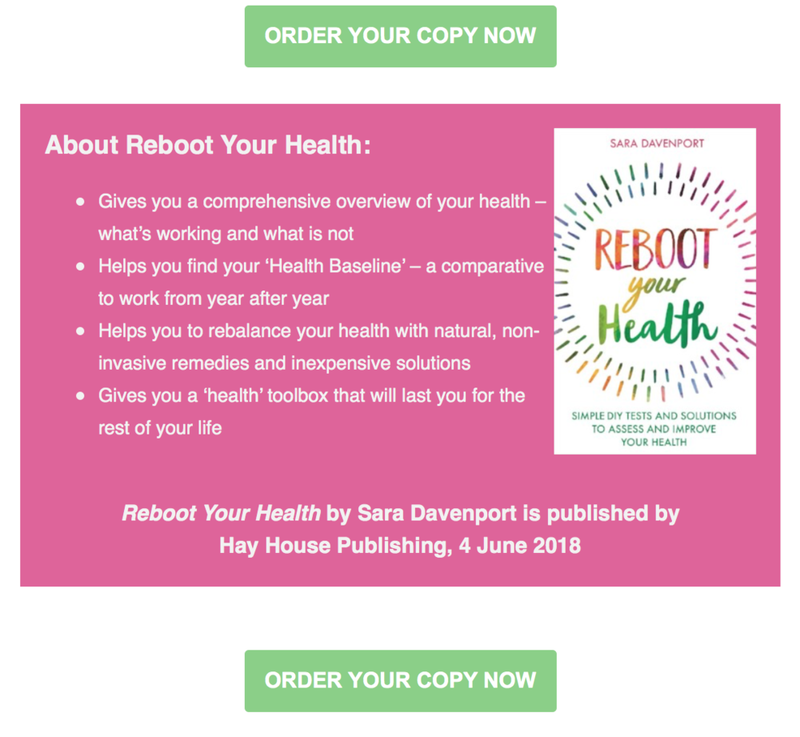 I wrote Reboot Your Health because, in these days of overloaded doctors surgeries and lengthy appointment waiting times, it seems ever more crucial that we take back responsibility for our health. One of my favourite phrases is ‘your body always whispers before it shouts’. But fewer and fewer of us have learnt the art of listening. If you can only hear what your body is saying you can spot problems way before you need to turn up on your doctor’s doorstep. The book starts with a simple, comprehensive health assessment. From simple DIY tests looking at sleep, saliva/urine pH, bowel habits, blood pressure, candida imbalances and other concerns, to tests you can ask your doctor or pharmacist for (thyroid, cholesterol, vitamin deficiency, hormone imbalance, inflammatory markers etc.) It’s a basic, easy to understand manual that shows you how to benchmark your own body against a range of normal. Check out average readings for heart rate, BMI, metabolic rate. What do your blood tests actually mean? Find out what’s working, as well as what’s not. And then choose what to do to to sort any problems, simply, inexpensively and non-invasively. I obviously would like it to do really well. Not, as you may be thinking for vast personal financial gain, because at about 60p a book it may take a while to swell any coffers and pay back my advance, but because I want as wide an audience as possible to hear about it. I think most of us have forgotten - or maybe never knew - what past generations took for granted. Much like cooking (which not many of us are particularly good at any more - going to the supermarket to buy ‘instant’ ready meals is so much simpler than buying, preparing and cooking a home cooked meal), we’ve lost the art of self-healing. We now just rush to the doctors for a prescription rather reaching into our medicine cabinets for a natural health remedy as a first solution. Yet catch any health issues at an early stage and you can stop them in their tracks before they turn into anything more serious. I would really appreciate any help with getting the book to a wider audience so click on the link if you would like to be taken to Amazon. Equally, if it’s not for you, please ignore this email, press the delete button instead and accept my heartfelt apologies!